Tension Ranges from 0 - 6,000 Grams: The CF Series transducers are designed for cantilever mount with a circular flange. 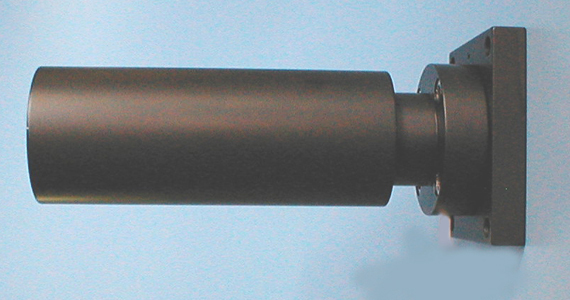 There are three (3) standard mounting flange options. The Rear (CFR) and Front (CFF) flange versions allow for flush mounting or through a circular hole in the machine frame or wall. The Middle (CFM) has the flange toward the middle of the cylindrical body and can be installed through a hole in the machine. 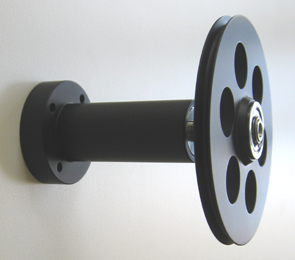 The mounting flange can be in front of the plate or behind the plate to meet your stand-off distance for the attached sensor roller. CF Series tension sensor ranges available from 0 - 6,000 grams. 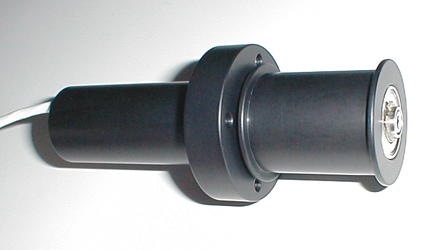 For wider Webs, Tapes and Films that require the roller to be close to the machine frame, the CFW Version of this Tension Sensor Line is offered. See associated CFW drawings for dimensions and options. Tension Ranges from 0 - 25 Pounds: The CF2 and CFW2 sensor bodies are slightly larger in size than the CF Series, to accommodate higher tensions from between 0 - 12 lbs and 0 - 25 lbs. See the technical doc for help in determining the proper range selection. The CF, CF2, CFW and CFW2 sensor bodies all accommodate only a single roller, therefore requiring the two additional fixed (constant) material contact points that you must supply. Click here for further information about roller positioning considerations. 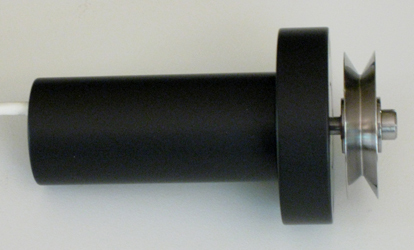 All TMI Strain Gaged Tension Transducers and Load Cells are full bridge 350 ohm or 1000 ohm sensors. They require an electronic signal conditioning module. This is typically a Digital Panel Meter with Display or Strain Gage Amplifier module. These units must provide the sensor's excitation voltage and be able to process the mV/V signal from the sensor. Click here for electronic indicator options. for the three standard mounting flanges. Sensors can be calibrated to read in grams, pounds, ounces, kg, cN, Newton, etc. FOR ASSISTANCE IN DETERMINING THE BEST SENSOR RANGE FOR YOUR APPLICATION CALL OUR APPLICATION ENGINEERS AT 1-800-470-3322. ALSO SEE RANGE CONSIDERATION DETAILS.